What is the perfect smartphone display size for you? We recently brought up the question whether smartphone displays were not getting a little too big for us to be able to use them comfortably. Sure, having the additional real estate has its advantages - viewing photos and videos is quite a pleasure on a bigger display, but a drawback that tends to plague huge screens is that you often need to use both your hands to navigate around. That being said, which smartphone display size do you fancy the most? 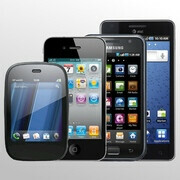 (June 2011) What is the perfect smartphone display size for you? Less than 3.5 inches – The smaller, the better. Navigation is easy and the smartphone fits nicely in the smallest of pockets. Between 3.5 inches and 3.99 inches – Small enough to use with ease, yet big enough to read fine text. Between 4.0 inches and 4.29 inches – The extra real estate proves useful when viewing photos and videos. 4.3 inches and above – No display is too big for my hands. Less than 3.5 inches – The smaller, the better. Navigation is easy and the smartphone fits nicely in the smallest of pockets. Between 3.5 inches and 3.99 inches – Small enough to use with ease, yet big enough to read fine text. Between 4.0 inches and 4.29 inches – The extra real estate proves useful when viewing photos and videos. 4.3 inches and above – No display is too big for my hands. You're wrong bro, my both phones have 2.4'' screen size and 3.5'' screen size respectively, yet I voted for '4.3'' and above' cause I like it bigger. All about choice bro!! I voted for ''4.2'' and above''. Though I think 4.3'' is the perfect size for me. not so sure about that. people like me may have one size on their phone but wants a bigger/smaller one. in my case i have a 3.2" display but i definitely want to get a 4.0-4.2 display. Galaxy SII..I'll have what he"s having..4.3 inches of pure perfection! 4.3 - lg revolution, moto x2, sam charge. I like the size of the 4.3's.... maybe even a little bigger..... but I don't want to be holding a Galaxy Tab or iPad up to my head..."Can you hear me now?" 4.3! and im sure all those smaller iphone voting people vote smaller bc they dont have bigger... just wait till the new iphone comes out with a larger screen. this poll will look drastically different. I want the option for just 4.3" Anything bigger than that to me is pushing it, and would not be comfortable to carry around all day. When edge to edge screens start popping up, 4-4.3" will be perfect for most people. Now we need to get them 1920x1080. 4.5" is perfect for me because my phone is more for entertainment than for actual talking. It's a mini tablet size with phone capabilities. Hercules! Hercules! Hercules! It's not the Size that counts, it's what you can do with it!! j/k. Bigger is always better! 4.5! 4inches is probably the perfect size. 95% of the phones with 4.3in. screens all seem too bulky or too long. Granted, some are thin but length and width wise they aren't as pocket friendly as say a phone with a 3.5, 3.7 or 4in screen is. The only phone I've seen with a 4.3in screen that doesnt look unattractively long or wide is the HTC Thunderbolt. But it is still kind of thick depth wise. So across the board for men and women 4in. is the perfect screen size for a smartphone. I like my phone to fit in my pocket. If I need a large screen I have a tablet or laptop. These phone are too big these days. 3.5 is perfect.